Preheat oven to 150°C (300°F). 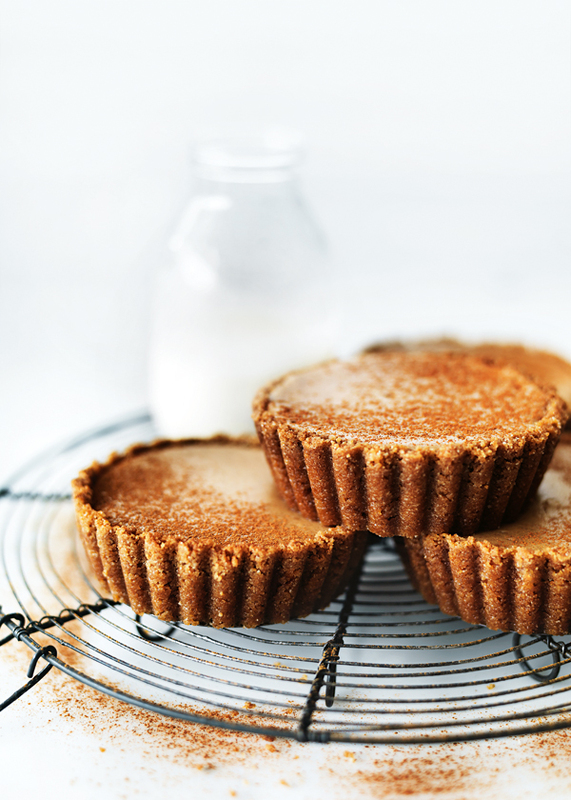 Place the gingernuts and almond meal in a food processor and process until coarsely chopped. Add the butter and process to combine. Using the back of a spoon, press the mixture into the base and sides of 8 x 8cm-round lightly greased, deep-sided and loose-bottomed tart tins. Refrigerate for 30 minutes. To make the filling, place the cream cheese and sour cream in an electric mixer and beat for 3–4 minutes or until smooth. Add the sugar, vanilla seeds, mixed spice, cinnamon and ginger and beat for 3–4 minutes or until the sugar is dissolved. Gradually add the eggs, beating well after each addition until well combined. I come back to this recipe again and again. It’s such a favourite of mine and my families. I make it in a 25cm loose based flan tin & bake for longer. So yum!